The LAX Coastal Chamber celebrated four champions of public service, philanthropy, the media and transportation at its eighth annual City of Angels gala on Wednesday, November 5. The business organization, which has more than 500 members from Westchester, Playa del Rey, Playa Vista, Marina del Rey and surrounding communities, holds the yearly event to recognize individuals, companies and organizations that have helped make a meaningful and positive impact on Los Angeles. 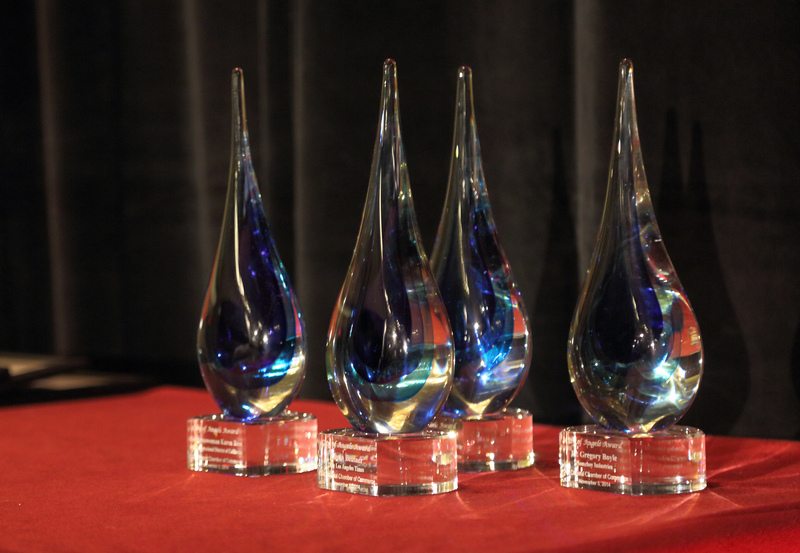 With more than 200 people in attendance at the Renaissance Los Angeles Airport Hotel, the four City of Angels honorees accepted teardrop-shaped hand-blown glass awards for excellence in their fields. Congresswoman Karen Bass, who represents the 37th Congressional District, was honored for her public service. In that office, Bass has advocated for local hire programs and for intellectual property rights. Bass currently serves on the House Committee on Foreign Affairs and the Steering and Policy Committee. Prior to serving in Congress, Bass made history serving as the first African American woman to serve as Speaker of the California Assembly. Austin Beutner received the award for his work in news and media, as well as his philanthropic endeavors. As publisher and CEO of the Los Angeles Times, Beutner oversees the Los Angeles Times Media Group’s portfolio of businesses, including the paper and its digital properties. He also serves as Board Chairman of CalArts, The Broad Stage and the Mammoth Mountain Community Foundation. In 2012, he founded Vision to Learn, which has provided free eye exams and glasses to thousands of Los Angeles area elementary school students. Founder and Executive Director of Homeboy Industries, Father Gregory Boyle, was honored for his work with the nonprofit, which is the largest gang intervention, rehabilitation and reentry program in the United States. Homeboy Industries, which is celebrating its twenty-fifth anniversary this year, employs and trains more than 300 former gang-members every year. The organization also provides free, critical services like job training, tattoo removal and case management to more than 12,000 people every year who are seeking to better their lives. Art Leahy, CEO of the Metropolitan Transportation Authority (METRO) accepted the award for his work leading the organization, the third largest public transportation agency in the United States. METRO currently has almost 1.5 million boardings a year and employs nearly 9,000 people. Past City of Angel honorees include Tommy Lasorda, Coca-Cola, Councilman Bernard Parks, the X Prize Foundation, the Los Angeles Business Journal, The Boeing Company and Los Angeles Mayor Eric Garcetti. The event is also the chamber’s yearly opportunity to honor its members who are celebrating milestone anniversaries with recognition and framed plaques. The recognition came as a welcome token for small business owner Rikki Barker who owns Wrapt in Wire, a custom hand-made jewelry line, specializing in gems and natural stones wrapped in wire, who is celebrating her fifth anniversary in business this year. Some of the businesses that were recognized at the event included Team Crockett, celebrating 50 years; Marina Towers celebrating 45 years; Warehouse Restaurant, celebrating 45 years; Carousel School, celebrating 25 years and Playa Vista/Brookfield Residential celebrating 15 years. Other chamber members celebrating monumental anniversaries this year include Westchester Lutheran, which is celebrating 70 years in the community; Flight Path Learning Center, which is celebrating 55 years and Playa del Rey’s Flowers by Felicia, which is celebrating 25 years in business. For some members, like Team Crockett’s Patty Crockett, whose company is celebrating its fiftieth anniversary this year, the recognition was also a chance to reflect on the importance of small family-run business. Her grandfather, Otto Cripps, founded the company, which turned into a family affair after her grandmother, mother and father joined the business. Crockett’s mother, Mary Lou, is remembered for her work in giving back to the community through a variety of nonprofits and for founding the Fourth of July Parade. Pictured: The City of Angel Awards Gala honors people who have made a positive impact on Los Angeles. PHOTO BY GLENN MARZANO.